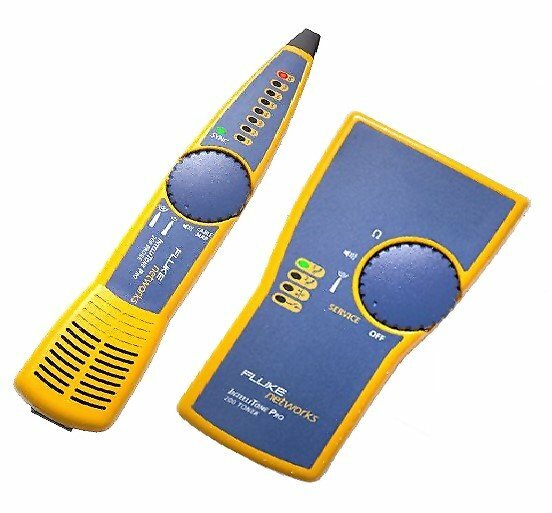 The IntelliTone™ Toner and Probe Series from Fluke Networks gives you a digital signal locating technology that's as advanced as the systems you work with. IntelliTone is a breakthrough solution—and the only solution—that locates and isolates even the most elusive, hidden or bundled voice, data and video cables quickly and reliably, even on active networks. With dramatic gains in speed, precision and productivity that make analog tools obsolete. Fluke Networks Engineering has applied decades of cable testing expertise to the science of locating copper cables. The result is what we call IntelliTone™ technology—a smart digital signal-toning and signal-interpreting process that rapidly and precisely zeroes in on even the most elusive cables. With IntelliTone™ digital technology, analog hassles are history. IntelliTone™ Toners and Probes succeeds in all of the situations where analog technology fails—such as locating cable in a bundle despite signal bleed from cable to cable. Differentiating the tone from noise or a false signal. And finding a signal due to active network terminations. The IntelliTone™ Probe's signal selection thumbwheel lets you choose which tone type to use. Controlled LED signal indicators and audio tones simplify signal interpretation and take the guesswork out of cable location, reducing even the toughest locating problems into a few minutes' work. The IntelliTone™ Toner and Probe also does the work of multiple testers—integrating the essential diagnostic and troubleshooting features to validate cable conductor continuity, identify service, and troubleshoot as needed. It would take two to four other testers to locate and test the diverse array of cabling types that IntelliTone™ handles. One of the toughest, most time-consuming parts of locating a cable has been in tracing its path through walls, ceilings or wiring closets. The IntelliTone™ smart digital signal features a LOCATE tone that provides maximum radiation, allowing you to quickly locate hidden and hard-to-find cabling from a distance. Cabling installations have become increasingly complex, which has made cabling increasingly difficult to locate with analog technology. Cables from individual wall jacks or devices are often brought together and run in bundles to a central area or panel. When cables are run together for even short lengths, a signal from one can bleed over to another. Twisted pair cabling is the toughest cabling to isolate with analog audio toners and probes. One cable might carry the original signal; another cable might carry the signal as a result of bleed. Isolating cables with analog tools requires guesswork, training, time for repeated testing—and even the best efforts often result in mistakes. The IntelliTone™ Toner uses the unique properties of twisted pair cabling to create a balanced signal that minimizes the effect of signal bleed. The smart digital signal processing in the IntelliTone™ Probe clearly identifies this signal with audio and LED visual indicators, allowing you to rapidly isolate the correct cable from a bundle or on a patch panel. IntelliTone™ eliminates hours of cable confusion—and you can count on getting it right the first time. Fluorescent lights, machinery, computer monitors and electrical wiring all produce noise that slows down cable location or makes it impossible with standard analog audio toners and probes. Together, the IntelliTone™ Toner's synchronized digital signal and the IntelliTone Probe's controlled signal identification technology reject noise and false signals to clearly identify cable location. This advanced capability alone can save you hours every week on cable location projects.